The long-vacant, and unfortunate lot, at 1911 Walnut Street is finally about to be filled with a dramatic new residential and retail development. This new tower will be, by far, the tallest on Rittenhouse Square. 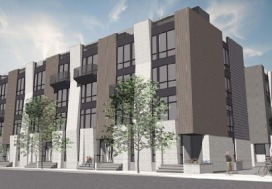 It is being built by Southern Land Company, the developers of 3601 Market Street in University City, and designed by architects Solomon, Cordwell, and Buenz. 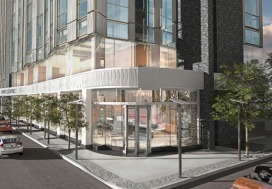 It promises to be a major new addition to the Rittenhouse neighborhood and Center City. The vacant site was once home to a movie theatre which burned down in 1994. The site was considered for a parking garage, with a new movie theatre, but that fell through. Then the site was bought by Castleway, a developer based in Ireland, for a new condo tower and hotel, but that also fell through. Southern Land Company bought the site recently for just less than $40 million, about the same price that Castleway had paid. 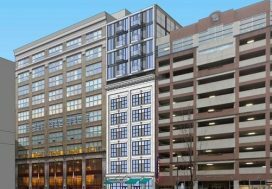 The site includes a parking lot at 20th and Sansom Streets, and three vacant buildings on Sansom Street. Historic preservationists have encouraged developers to save these buildings. Southern Land Company has agreed to save the historically-certified Rittenhouse Coffeeshop, but demolish the larger Warwick Apartments and a small funeral home next door. The new tower will be 600 feet tall and between 47 and 51 stories tall (the developers still haven’t decided the breakdown of floors). It will have 342 apartments and between 64 and 75 condos. There would be three floors of retail, with entrances on . The parking would all be underground. The design right now is still subject to some change, as the developers are still talking with neighborhood groups and the City Planning Commission. This new project would join several other developments nearby. Across Sansom Street is the site of the former Boyd movie theatre, which will be replaced by a 32-story apartment tower and up Walnut Street two small developments of luxury townhouses are being built.